Our first look at The Incredible Hulk Special Edition DVD cover art comes courtesy of Comic Book Movie and highlights the Hulk and Abomination battle that raged in New York. There are no specs for the dvd or information on when it will hit store shelves, however as the cover art clearly indicates, it will be a 3-disc special edition! Does that mean we will get Edward Norton's cut of the film? What about the Captain America cameo that Luis Leterrier promised? Reports are that the DVD will include for 70 minutes of new footage! 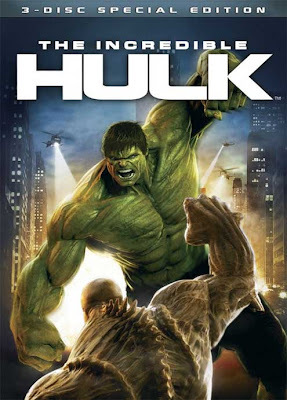 More to come on Incredible Hulk dvd, for now check out the cover art below! Thoughts on the Incredible Hulk dvd cover art? Did you like the film? Did you like it more than the Ang Lee version?